With over 14 quadrillion nano particles per packet, our products quickly penetrate the cell walls and help optimize the body's power centers, trillions of mitochondria. Our Krono Wellness System provides deep cellular cleansing of dangerous toxins damaging our bodies and powerful protection to keep us healthy. This quick absorption can also create a visible increase in micro circulation, decreasing dangerous inflammation, allowing the body to heal itself naturally. The body functions optimally in an environment that is slightly alkaline. Unfortunately, many of the byproducts of cellular metabolism, digestion and other daily processes produce a great deal of acid. 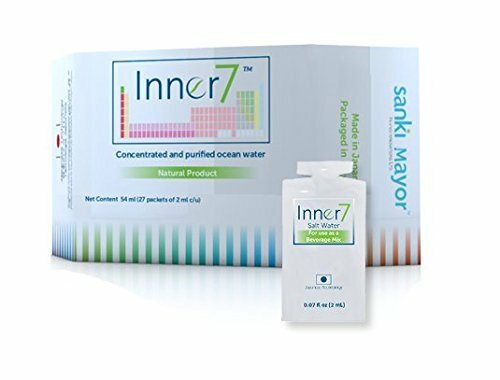 Inner7 is purified deep seawater that balances the pH of the body avoiding demineralization and subsequent decalcification. Contains minerals such as: Magnesium, Potassium, Calcium, Iron, Phosphorous, Zinc, Copper, Selenium, Chromium, and Manganese. Removes toxins in the body. Boost Energy levels. Help slow the aging process. Improve circulation. Help decrease inflammation. Help the body repair itself at the cellular level. Aid in the digestive process. Improve metabolism. Reduce fat accumulation. Support Weight Management. If you have any questions about this product by sanki, contact us by completing and submitting the form below. If you are looking for a specif part number, please include it with your message. Absolute Greens -242 grams- A GUARANTEED DELICIOUS way of providing the antioxidant power of over 10 servings of fruits & vegetables in every scoop!